As an art student at ACU, Rebecca Barker (’04) helped shape one of the campus icons, Jacob’s Dream, an almost 40-foot bronze sculpture, surrounded by weathered stones. Now Rebecca helps shape other artists’ work as head patineur and conservator of Deep In The Heart Art Foundry in Bastrop, Texas. Her work on Jacob’s Dream, a creation of art and design professor Jack Maxwell, is one of the highlights of Rebecca’s college experience. “Not only is it a beautiful piece, but it means a lot to have been a part of a project for my alma mater,” she says. Rebecca went to work for Deep In The Heart foundry shortly after graduating from ACU with the intent to gain practical experience and build a portfolio for graduate school. ACU’s Art and Design Department prepared her well for her job. 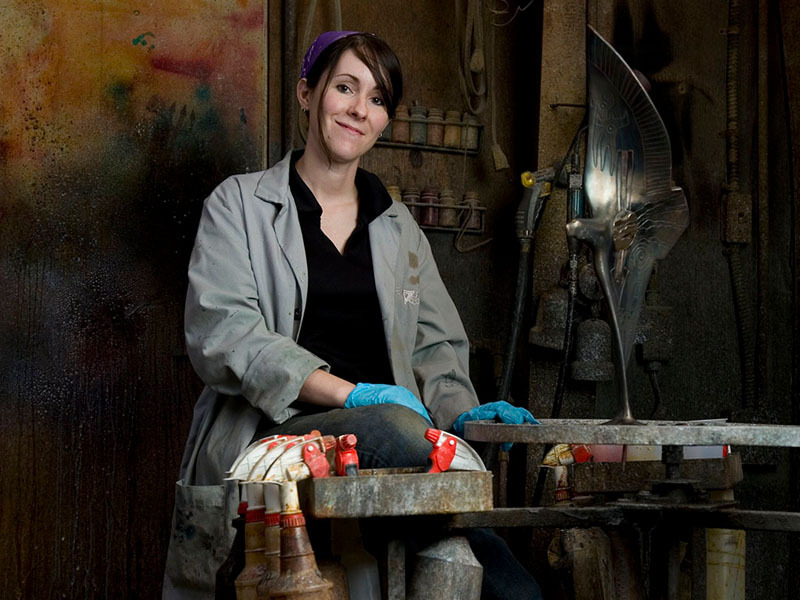 Associate professor Geoff Broderick “was an awesome mentor and taught me a lot about the bronze casting process, which has helped me in my career here at Deep In The Heart,” Rebecca says. Learn more about the Department of Art & Design. Learn more about Bachelor of Fine Arts degree.